In recent years, researchers have stepped up the focus on the identification and tracking of great white sharks in an effort to find out more about these enigmatic ocean predators. To date, there have been three main channels to achieve this – tagging, DNA testing and dorsal fin identification. For dorsal fin identification to be accurate, the photos used to record fins need to be taken straight on – not always an easy feat in rolling waters. Water droplets or reflections of sunlight can also mask distinctive physical features. This is particularly true for the lower section of the fin, which is closest to the surface of the ocean when exposed, and more likely to be obscured by these factors. The facial recognition program used to process the fin images did not translate well to fin identification, turning up unreliable results. To reduce the error rate, Rutzen and Andreotti came up with a ‘barcode’ identification system – they split fin images into three distinct sections, and matched each section at a time. Using this method allows for reliable comparisons with other images even if one section of the fin is obscured – if the other two sections can be matched to an existing image in the database, the shark is likely to be one and the same. 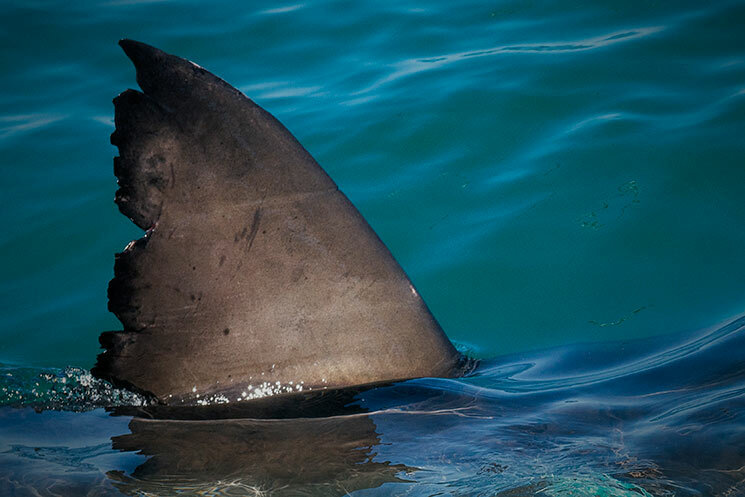 By matching images manually using the barcode system, Dr Andreotti built a database of dorsal fins over time that covers approximately 98% of the sharks visiting Gansbaai. This tells us that the same great white sharks come back to the area time and again.